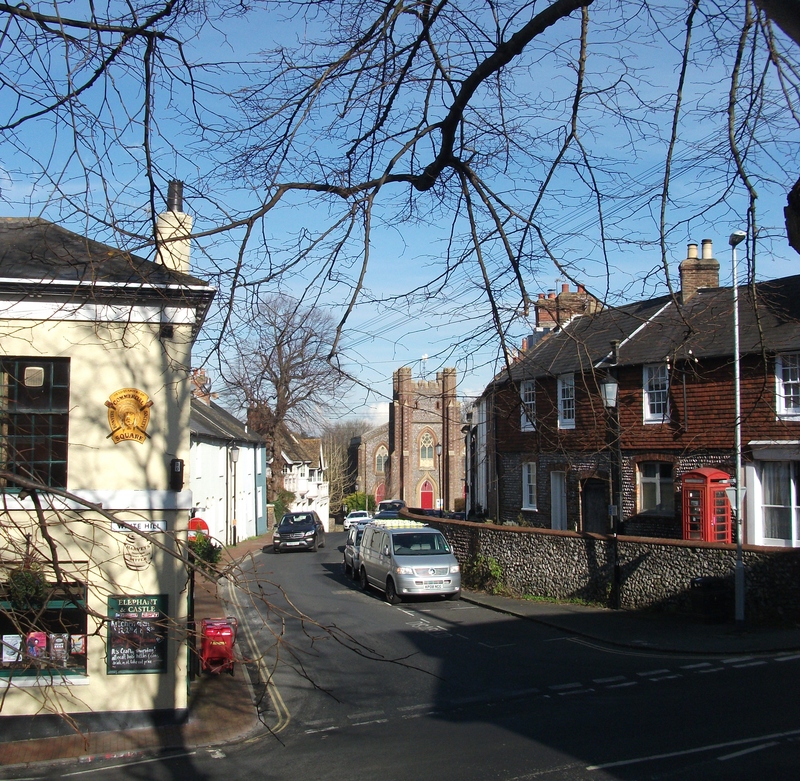 Nowadays Abinger Place is a residential area in the conservation area of Lewes and a broad, one way thoroughfare for traffic. It is also used by many pedestrians on their way into town from the Landport, Malling and Pells areas. As a 21st century resident in Abinger Place I became fascinated by its past and inspired to do some research after seeing an exhibition about neighbouring Sun Street in 2015. I started by imagining what Abinger Place was like before it was developed in the early 19th century as part of Lewes New Town. What had the land been used for? Who owned it? Was there always a track or road or path? What is the story behind the gallows? These and other questions sprang to mind. However, the story of this area starts much earlier when the first, original church of St John was built at the north end in Saxon times. Throughout the centuries, various events and developments in the town had an impact upon the area. Some signs of this early history, such as the flint wall on the west side and the plaques about the gallows and the stocks, can still be seen along the road today. This summary describes how the piece of land (now Abinger Place) situated on the crest of a steep hillside on the north west side of Lewes, was shaped by events in the town throughout the centuries from Roman times to the 19th century. It has been speculated that the Romans may have continued westwards from the Roman road which has been traced as far as Earwig Corner, to a river crossing at Malling (possibly where Wileys Bridge is nowadays) and up the present St John’s Hill and along the hillside where Abinger Place and St John’s Terrace now exist. Although the plaque on the row of houses known as ‘The Fosse’ (1902) in Lancaster Street claims the site to be Roman in origin, there is no direct evidence for any encampment. The town developed during this period and it is thought that the town wall possibly extended along Abinger Place, down St John’s Hill and along Brook Street taking in the the rocky outcrop on which the church was built. Part of a flint wall can still be seen today on the west side of Abinger Place although this is unlikely to be the original. The Saxons were pagans and rituals took place in Sussex before 664. Three large mounds once stood in the area now Abinger Place and another in the churchyard (see diagram below which also shows Brack Mount). These mounds were excavated in the 1830s when building development began and records tell of animal remains indicating the use of burial or sacrificial mounds. Of the three in the area of Abinger Place, one mound was on the site of the Elephant and Castle public house, a second on the site of Number 1 Abinger Place and the third on the site of the present St John-sub-Castro church. Open land such as this, the property of a manor, was also used for keeping animals (a Pound), storing timber and growing fruit and vegetables. During this period, raids by Danes along the Sussex coast threatened the safety of those living outside the town walls. Those seeking refuge therefore settled temporarily on the open land within the town such as that where Abinger Place is now. 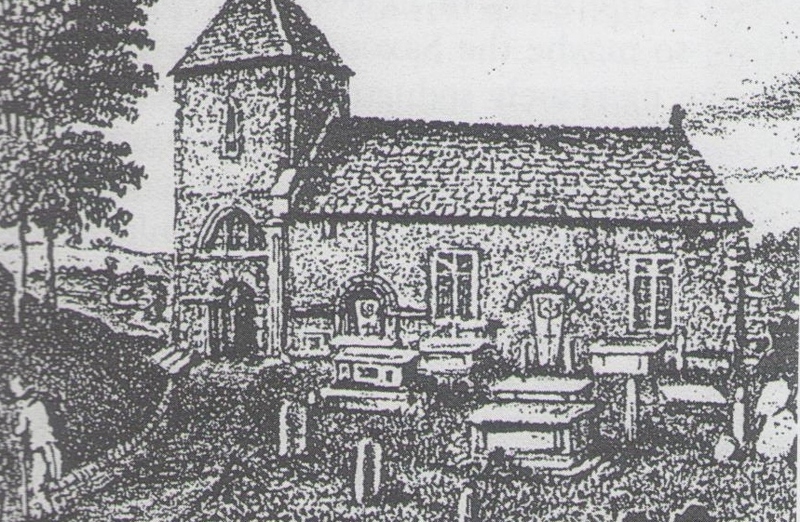 The Christian church of St John’s was probably built in the 680s and was possibly the principal church at the time. The earliest documented evidence for St John’s is dated 1121. Remnants of the church, including a doorway with its medieval inscription to Magnus, the Danish warrior prince who became an anchorite (hermit), were incorporated into the fabric of the present church which was built in 1838 and can still be seen today. In Britain, death by hanging was the principal form of execution from Saxon times until 1964 when capital punishment was suspended. The crest of a hillside on the outskirts of the town was an ideal place for a body to be hanged as the gallows would have been visible as an example for all to see. Up to May 1868 all hangings were carried out in public and attracted large crowds who were supposed to be deterred by the spectacle. Probably many went for the morbid excitement and the carnival atmosphere that usually surrounded such events. The expression Gala Day is derived from the Anglo-Saxon ‘gallows day’. Nowadays a plaque marking the site of the gallows can be seen in the town wall on the west side of Abinger Place. Further along Abinger Place is a plaque noting the site of the manor pound and the stocks opposite. Stocks were often placed near churches so that those held in them could be easily ridiculed and humiliated by anyone walking along the path to the church. Stocks ceased to be used in England 1872. By the late 18th century the judiciary system had considerably developed and in 1796 Assizes were held in Lewes. Visiting judges now passed sentence on more serious crimes. Those punishable by execution were then usually taken to Horsham be hanged although a few suffered this fate on Gallows Bank. In 1747 the body of a soldier who had been hanged for desertion, was moved from a grave near the gallows. It was not until 1831 that the gallows were moved to Lewes Prison. After the initial disruption and upheaval caused by the Norman Conquest in 1066, Lewes, now under the control of William de Warenne, again became a thriving centre for commerce and administration with its agricultural and river trade, mint and judicial court. Agriculture on the South Downs and along the coastal plain became increasingly intensive.The land surrounding the church was ceded to the newly built cluniac Priory when this took St John’s church under its patronage. It is likely that by 1300, a path (which could have been the forerunner of Abinger Place) enabled people to go between the town and the church and between the castle and its fishponds in the harbour basin on the Pells. In contrast to earlier times, this era was one of decline in Lewes and throughout the country. The 100 Years War with France and a series of floods contributed to a disruption of commerce, pillage and plague. The overall result was a dramatic decrease in the population and houses were frequently abandoned. People became desperate during these hard times and in 1396-7, the parson of St John’s was charged with robbery from Hamsey church and from a house in Lewes but was later granted a King’s Pardon. By the 1430s both the castle and St John’s Church had become semi-derelict. Very likely the surrounding waste land became unkempt and overgrown and the path to the church little used. Following the dissolution of the monasteries between 1536 and 1541, the land in front of the church (now Abinger Place) returned to the church and services at St John’s continued to play a significant part in the community despite the countrywide religious and political discord between Catholic and non-Catholic. 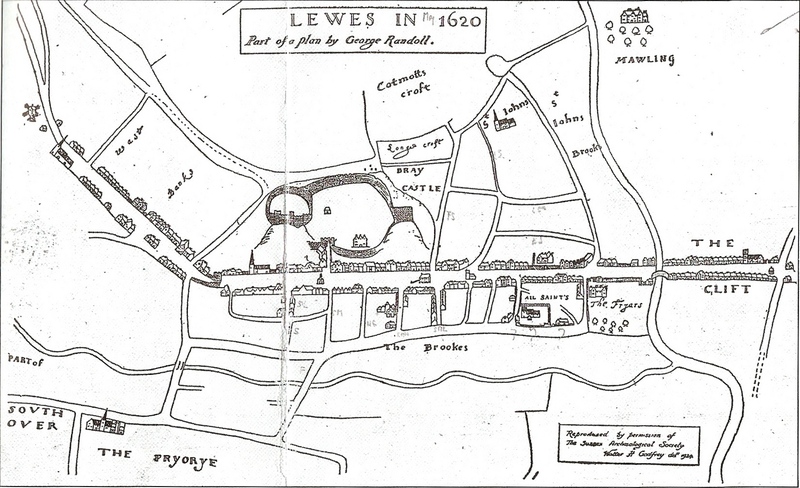 The earliest map of Lewes (above) made in 1620 shows the land in front of St John’s and a lane running from the end of Fisher Street to the church. Presumably this was much used by parishoners. No doubt other less defined paths were also made across the waste. The growth in the local economy during this century was based on sheep and corn farming and the heavy demand for wool resulted in escalating prices. Important infrastructure developments, such as a stone arch bridge to replace the wooden one over the Ouse in 1727, made access easier through the town. On a smaller scale a pathway through the churchyard became a much used shortcut to the tannery in Greenwall. However, by 1779 the church itself was in bad repair and the land to the south of it, known as St John’s Croft, had changed into private hands. The first conveyance is dated 1711 and concerns the sale of a meadow and barn by Matthew Atridge to Geoffrey Haines for £440 in settlement of a debt. In 1750 a part of the meadow was sold for £135 by Matthew Atridge’s sister, Mary Greenfield, to Thomas Friend (a wealthy wool dealer who lived at Barbican House). In 1761 Thomas Friend left this land to his nephew John Kemp (also a wool merchant) who died in 1774. 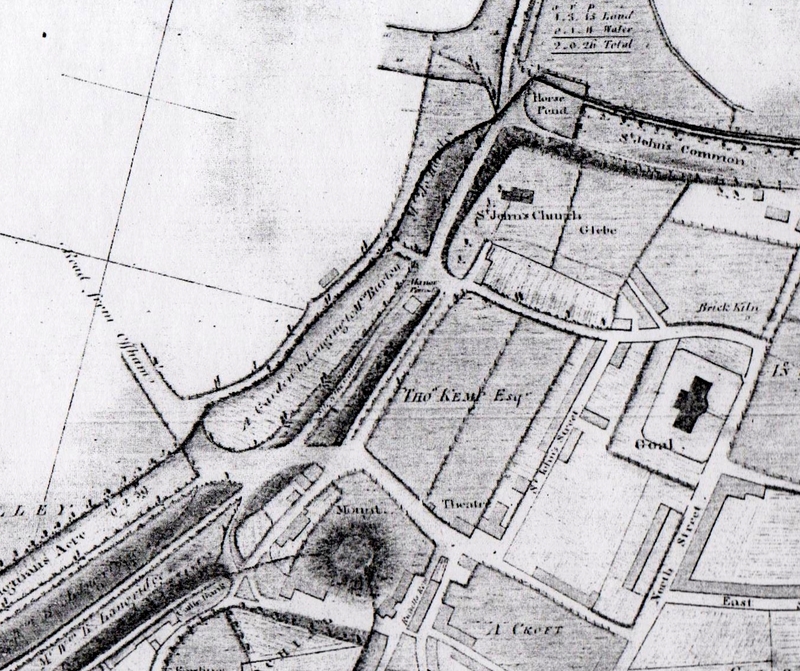 In 1775, the land became the property of Thomas Kemp and St John’s Croft became known as Kemps Field. The Kemps are one example of a family whose wealth and status increased as the wool industry thrived. In 1780 Thomas Kemp, married to Ann Read (the daughter of a rich sheep farmer on Romney Marsh), was elected MP for Lewes Borough. Their son, Thomas Read Kemp, married the daughter of banker Sir Francis Baring. The 1780s were a time of expansion in the building industry and it would seem that the Kemp family had the foresight to see another opportunity for making money. Until now there had been little building in Lewes outside the medieval walls. However by 1795/6 the area which is now East Street, Little East Street, North Street and St John’s Street formed the beginnings of the New Town. As the developement of the new Town spread westwards part of Kemps Field became Sun Street. The area which later became Abinger Place was about to be developed. This will focus on a time of rapid development in the 19th century which included the development of a residential area, a new church and a pub. The new road was first called Church Street and later changed to Abinger Place. There are also events and anecdotes from the 20th century worthy of inclusion in this history of a Lewes road. I have talked to other residents in Abinger Place who have kindly helped me brainstorm areas of interest relating to these later periods, lent me deeds of their houses, told me anecdotes and introduced me to resources in Lewes Library and the Keep. In due course this material will form the next summary. I will be grateful for any photos, press cuttings and records and anecdotes that readers want to include.